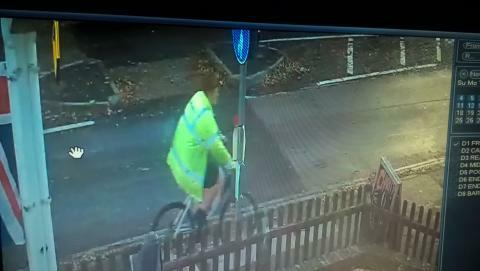 ​​Do you recognise man cycling in high vis jacket? We want to speak to this man in connection with an incident where 71 year old woman had her handbag snatched in Lymington. The incident occurred at 2.50pm on Sunday, November 11. The victim was walking along Avenue Road. The suspect, who was wearing a bright yellow jacket, approached her from behind on a bicycle and snatched her handbag out of her hand before riding off into a side road. He then turned round and cycled towards Lymington Police Station. The victim’s handbag contained her mobile phone and purse. If you have any information about this crime, please ring 101, quoting reference 44180423851. Alternatively call Crimestoppers on 0800 555 111, quoting the same reference.